Network Screens 46" and 55"
Metal Cased Monitors 5" - 42"
Our popular CRT monitors are no longer in production but there are many in the field still providing excellent service. We still carry a large number of spares including CR Tubes, components and a few complete chassis units. Please have a look at our Stock Listing and Contact us. if you see anything you want. 99% of repairs undertaken are completed within 1 hour and are charged accordingly. The average turn round on most repairs ( excluding 24 hour soak test ) is 3 days. All repairs, once returned, are warranted for 3 months. Our hourly repair rate is only £ 85 + parts. Our final invoice to you will include the hourly rate plus parts, plus return delivery charges plus VAT. 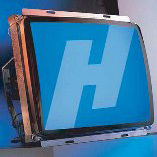 CRT replacement monitors using LCD technology are available but now only for the 15" monitors. This is because LCD panels with a 4:3 aspect ratio are no longer manufactured in larger sizes. 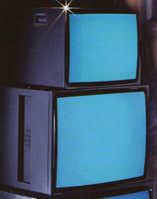 The LCD15” MGG P and LCD15” MGG PI are manufactured in the UK to look the same as the original CRT. They will both accept a PAL (Composite video/CVBS) input but the PI version has an inverted TFT panel to enable the display to be better viewed from below. The LCD15” MGG V will accept a VGA (PC) input. The LCD15” MGG L is designed to accept Legacy** signals via various inputs. Optional cables are used to convert the input to 9 pin "D" or RGB or RGB + Sync(s) or SCART. These monitor do not have a PAL input. Please Contact us for further detail, price and availability. ** The description of "Legacy" defines a monitor that operates below VGA standard (31.5kHz Horizontal Scan Rate) and can be classified as slow scan (15 – 30KHz Horizontal Scan Rate).